Together through this Wintertide,‘ out of time and out of place’, we witness closely the strands of life and death. Bound through ancestral totems, we are drawn into their mysteries. We are gifted the opportunity to unite in troth, with our brothers and sisters, to share intimate time with them, to hold them dear. We strike up the Hel runes, light the Nyd fire, harken the Call to the Old Ones, our beloved Ancestors: thus we walk with all Kith and Kin. How others mark this tide, I would consider it a privilege to learn from all true souls. Contemplating upon our Fate of, being, before, and beyond, we have already noted the present. The past is always with us. On this, and at this time I was remembering a dear brother and friend, who, born with chronic asthma, told us he should have been dead in his teens, but went on to become a Black Belt, Fifth Dan and Martial Arts Master. Yes, he surely cherished his gift of life – by living every precious moment. But more than this, he’d dedicated his all too short life to the people, and to all people, spending three decades with the Saint John’s ambulance troupe by choice, in nursing as his role in society, and giving what remained of his free time to Martial Arts Exhibitions for Charity. Massive steroid dosages that controlled his asthma eventually destroyed his vital organs; yet in his final moments, as his lungs slowly atrophied, he drew his last few breaths with the broadest grin imaginable. Those privileged to know this blessed soul, will know how true his intent, embracing death with elation; the mark of a true warrior. For him, the Hel runes were struck, and mead flowed. He, like another honoured brother, had understood death as a transition – staged to shift us from flesh to the ‘Other’. They’d crossed the Lethe many times, and their conviction in the reality of the ‘Other,’ as Robert Cochrane asserted, replaced Faith with Certainty. At each Hallows they sit with us still. To the future we sow the seeds of our culture’s continuity; we embrace the future but never forget the past. Huggin and Munnin – their importance is immeasurable: the old craft saying of, nothing is forgotten, nothing is ever forgotten, is an absolute truism. And so, as we stand at the crossroads of the Now, we look to the Future, remembering all that is Past. CTC blesses all in Truth. May the Word protect you from the Lie! This stunning image was ‘Posted by Gudar och Gudinnor?’ Image of Hela on www.pininterest.com, also used on www.bonekindred.weebly.com If you are the artist or know the artist please inform me so that i may credit their work fully. ~ by meanderingsofthemuse on November 12, 2015. 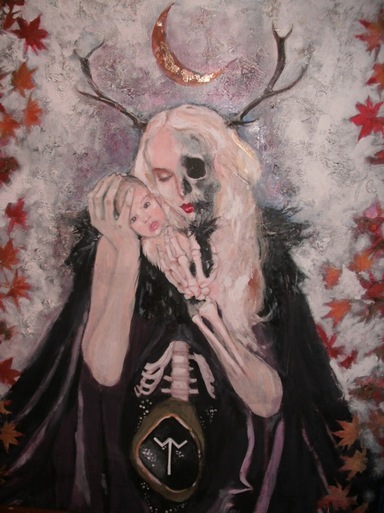 The artist is Katelyn Foisy, and the painting was done for a friend of hers who had a special connection with Hel. It resides again with Katelyn, as the friend went to rest with Hel Herself.